How Does Traditional Digital SLR AF Work? Canon Autofocus Series: How Does Traditional SLR AF Work? Here’s the basic layout used in today’s digital SLRs for autofocus. The green rays simulate light coming through the camera lens. 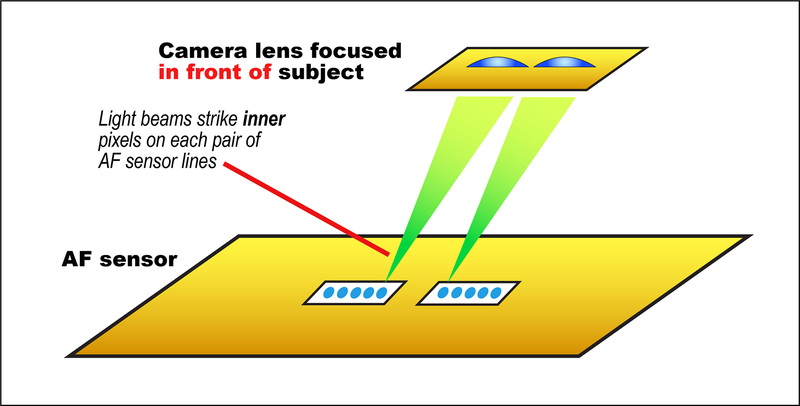 The main mirror in a DSLR is semi-transparent, and some of this light passes through the mirror, and is reflected downward in the camera. It ultimately ends up as pairs of sharply-focused rays of light, hitting the extremely precisely-positioned AF sensor. 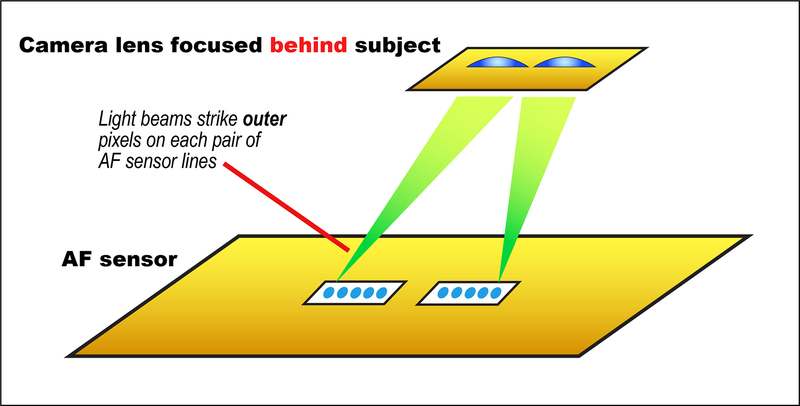 Phase-detection for autofocus is able to work because it can compare two incoming beams of light. In digital SLRs, a separate AF sensor is used for this. Unlike an imaging sensor, which has light-sensitive pixels covering its entire area, the AF sensor uses lines or rows of pixels. 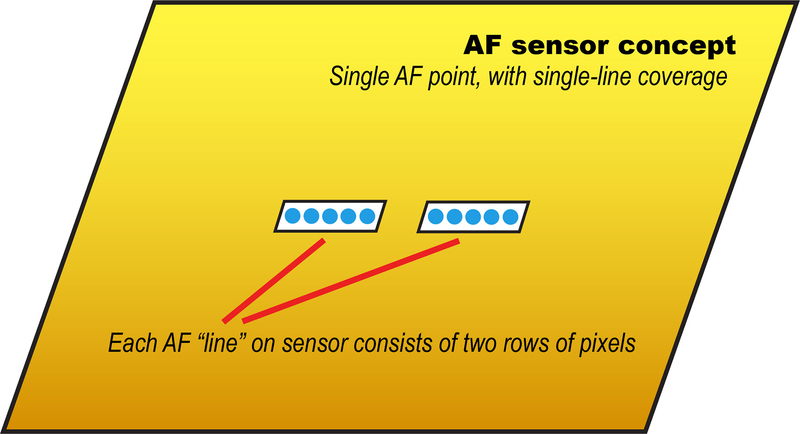 For each “line” used for focus detection, there are actually two lines on the AF sensor. A single incoming beam of light is precisely split in two, and focused upon each row, illuminating either the pixel at the center of each row, or pixels further inward or away. Incoming light from the camera lens passes into the very precise AF optical system. 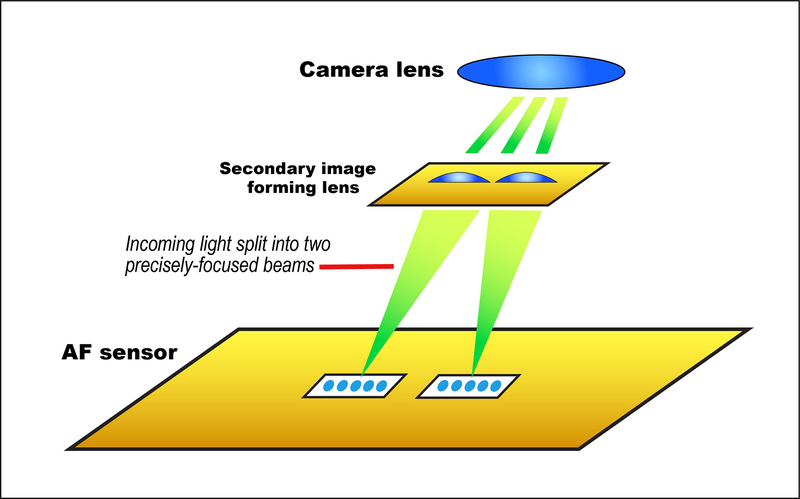 The secondary image forming lens splits this single “beam” of light into two separate and sharply-focused beams, which are aimed at the pair of rows of pixels on the imaging sensor. Which pixels they illuminate on the two rows immediately tells the AF system whether you’re sharply focused or not. Each pixel on the pair of light-sensitive lines on the AF sensor can individually detect when it’s being hit by incoming light. When the main camera lens is not properly focused, the two incoming beams of light either spread wider, or move closer together. Focused behind the subject? The two beams spread farther, each illuminating a pixel away from the center — and instantly telling the AF system that the lens needs to be driven to a closer focus distance. And, the system can calculate immediately how far to drive the lens, too, based on which pair of pixels (one per line sensor) is initially hit by light. When the center pixel on each row is struck by light, the AF system knows it’s seeing sharp focus at whatever that AF point is being aimed at. 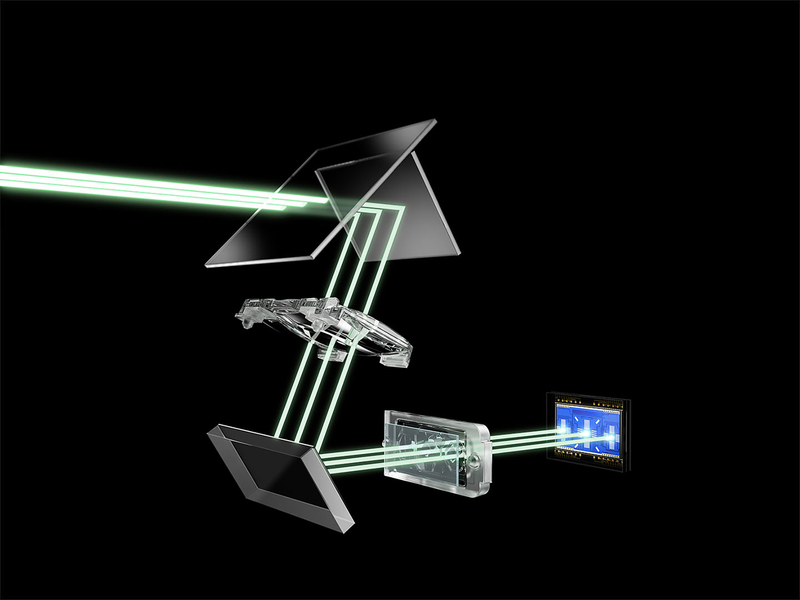 Phase-detection AF systems for digital SLRs have certainly evolved over the years. 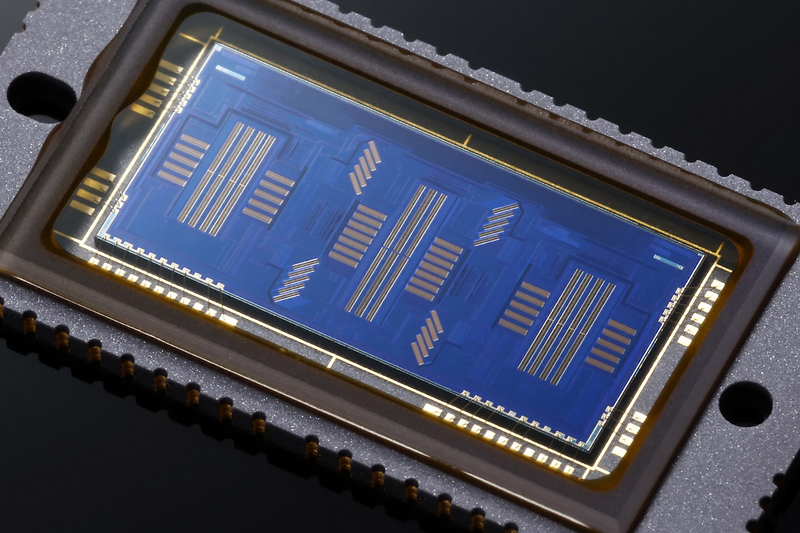 Compare the conceptual illustration of a single pair of rows of pixels (above), depicting an early AF sensor with one AF point, to this image of the AF sensor on today’s EOS-1D X Mark II, which has 61 AF points — most of which offer cross-type coverage.